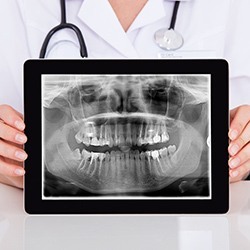 A Panorex image is an x-ray that creates a panoramic view of your mouth from one side to the other. This image can help your dentist understand the relationship between your teeth, jaws, and occlusion (bite, or how your top and bottom teeth fit together). When planning extensive restorative or cosmetic cases, a Panorex may be necessary in addition to intra- and extra-oral photos and digital x-rays.